Ever thought what it would be like to be living in 22nd century? How the future will pan out to be? Well no need to think further, because the future is already here at Ariisto Codename Big Boom Mumbai; where you can experience the rare 22nd century living concept of ‘techno-luxury’ residences. An uber-sophisticated clubhouse offering global lifestyle facilities and a wealth of leisure experiences, all wrapped in lush natural beauty, this Futuristic development is set to redefine Mumbai’s real estate landscape, making an indelible impact for the decades to come. Two of the world’s most sought-after addresses are Central Park, New York, and Hyde Park, London. Residences located around these stunningly beautiful, historic parks have a unique prestige that simply could not be acquired anywhere else. Until now! With its singularly beautiful setting at the foothills of the Yogi Hills and boundary of Sanjay Gandhi National Park, Codename Big Boom offers you the priceless advantage of a unique location, with an ultra-modern luxury lifestyle. An address that will command a huge premium in the years to come, and will remain a rare living experience forever. Driving through the magnificent gates of Codename Big Boom, an extraordinary vision unfolds before you. 4 ultra-modern proposed 40-storey towers rise from a beautifully landscaped 50,000 Sq.ft podium, situated 85 feet above the ground, forming a landmark that will define Mulund’s skyline for all time. Sleek and contemporary in design, the towers incorporate centrally-controlled sound and lighting features in the entrance, elevator and podium lobbies coupled with the very best multi-tier security for your loved ones. Best-in-class fire-fighting system including fire alarm system/sprinklers/hooters for common area and 2 fire staircases per tower. Within the gates of Codename Big Boom, the best security systems monitor visitors and vehicles, guaranteeing you and your family complete peace of mind. Generously blessed by nature, living in Mulund is a daily encounter with sheer natural beauty. The most enviable precinct within this beautiful suburb is the prized neighborhood of Ariisto Codename Big Boom Mulund right at the foothills of the Yogi Hills. Offering you an opportunity to live at an altitude 50 feet higher than the rest of Mulund, with the finest hill views and the best air quality index in Mumbai, while being just 5 minutes from the popular Cyprus-Yogi Hills trekking path, life here is healthier, happier and more privileged than anywhere else in Mumbai. And that’s not all; the location of Mulund is primed for an infrastructural & economical boom. It is the only suburb which is situated at the hub of MMR – between Thane, Navi Mumbai and SoBo. With the advantages of a green neighborhood and a ready social infrastructure, it is the most desired neighborhood in the Central Suburbs contributing to 42% of demand therein. It enjoys highest appreciation of 9.5% as compared to the market average of 7.1%. Now is the most opportune time for acquiring a home in Mumbai, with the lowest interest rates of the decade, which are expected to further move down. 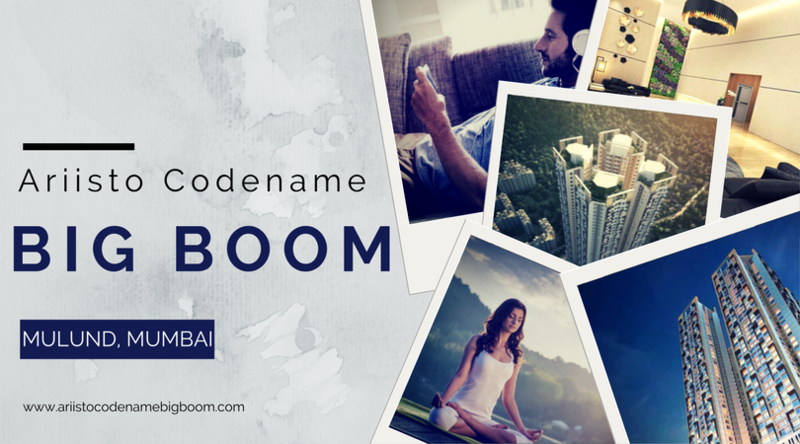 Here is your chance to make the most of the first mega pre-launch in the risk-free RERA phase – with all the advantages of a pre-launch and none of the usual risks associated with an under-construction offering; at Ariisto Codename Big Boom!